Sip wine (Chardonnay or your wine of choice) and write about an adventure that is close to your heart (like Hemingway’ escapades-though he likely wouldn’t have drunk Chardonnay). This will be an evening of exploration and discovery, digging deep for personal insight and guidance — the kind that is available to all of us. We just have to mine it from our depths. Come join the fun of writing and sharing with like-minded friends, old and new. Bring 1) your favorite bottle of wine to share, 2) paper (or journal) and pen–or computer if you prefer; and 3) a friend. You will capture immediate reactions to a thoughtful quote about an adventure that gives you a chance to warm-up your writing muscles. Then, you will explore your response to one of ten randomly selected prompts about your personal travel experiences, either past excursions or potential future ones. Finally, you will attempt to weave together the “outer” and “inner” journeys for self-discovery. 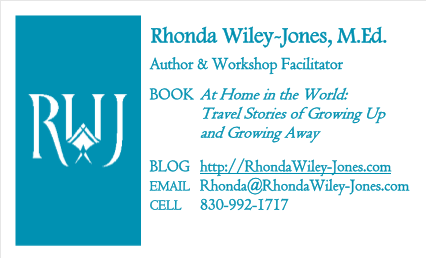 Email Rhonda at Rhonda@RhondaWiley-Jones.com to learn more or to make plans for a home party. Where is HOME for you? A place in space or a place inside you?